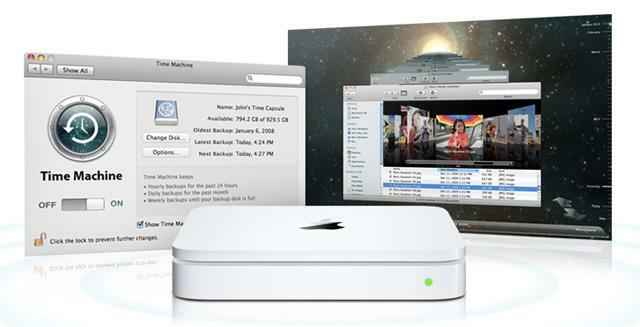 A routine update to Apple's Airport Utility application contains references to new 4th generation Time Capsule and 5th generation AirPort Extreme devices, according to a new report. After Apple released the AirPort Utility 5.5.3 update for Windows and Mac on Monday, device listings were uncovered in the update's binary, MacRumors reports. Apple's documentation for the 10MB downloads lists only that it "resolves an issue that caused the AirPort Utitlity to unexpectedly quit during setup." Of particular interest are listings for "K31 K30B Time Capsule (Simultaneous Dual-Band, Gen3)" and "K10B Apple AirPort Extreme (Simultaneous Dual-Band, Gen3)." Elsewhere in the code for the utility, the rumored devices are reportedly listed as "Time Capsule 802.11n (4th Generation)" and "AirPort Extreme 802.11n (5th Generation)." Apple's current simultaneous dual-band AirPort products, which were last updated in October 2009, are described as "Gen2." Recent reports have suggested that available stock of Apple's AirPort and Time Capsule wireless base stations has dwindled ahead of a product update. The latest rumors claim Apple may shift the base stations to run iOS. iOS-based AirPort base stations could allow for more robust features, such as print and media streaming services, integration with iCloud, and cached wireless software updates. Code references in AirPort Utility seem to support the likelihood of software update caching, according to people familiar with the matter. Also, indications that Apple is working on wireless drivers for non-Intel CPUs may point to the possibility that Apple plans to enable iOS devices to setup and configure new AirPort or Time Capsule devices without the help of a Mac or Windows PC. Such a move could align with Apple's Post PC strategy, as the company recently revealed that the forthcoming iOS 5 has been designed to be "PC Free" by way of wireless activation, syncing and backup.